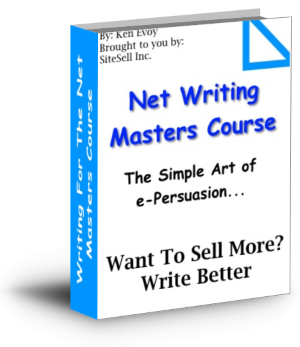 The Net Writing Masters Course e-book is here to help you write better sales copy. Want to sell more on the Net? Write better content. The power is in your words. Introducing the NetWriting Masters eCourse. Learn how to write effectively for the net. It is not about 'sales copy' it's about attracting visitors to yourwebsite. Unfortunately, at least 98% of small business websites start "at the end"... the sale. Great Net Writing is actually far, far more than writing great sales copy. Before you write to sell, take an order, clear a credit card and ship a product... You need traffic. PREsold traffic is more likey to purchase. Now for the good news... you can do this. How? Take The Net Writing Masters Course ebook. It is the only book about writing for the net that covers both PREselling and selling (just about every other book on Net writing focuses only on how to write to sell this itself is a reflection of that "starting-at-the-end" philosophy). And now for the best news of all...(wait for it. )...The Net Writing Masters Course e-book is free.Writing effectively for the net (i.e., the kind that generates income) is indeed something that anyone can accomplish. There is nothing complicated or magical about it. And you don't need have an English degree or be a literary genius to do it. So give them what they want. Surfers on the Net are not looking for you or your business. People search for information and solutions. Long before you make your first sale, provide the information (high value content) that people are searching for in a way that the Search Engines like. Create content that OVER delivers what your visitors seek! Most small businesses fail on the Internet because they prepare to sell and collect money, before they have provided what their visitors are searchingfor... information. These small business owners build a website to sell and some how figure that traffic will just show up and be willing to buy or hire immediately. This is wrong thinking. Wrong thinking... wrong process... no results! It's like pushing a string. You have to pull instead. Pull targeted visitors into your site, PREsell them first... then, and only then, sell. Let's boil it down to four simple steps..
4) Convert traffic to dollars -- sell (whatever that may be... hard goods, e-goods, services, information, even clicks on Google ads). As you can see, the first three steps involve a completely different kind of Net writing. Write to deliver what humans want... information. And write for two audiences, the Search Engine spiders and the humans. That's what effective PREselling is all about! To date, all the attention about writing-for-the-Net focuses on only one of the four key steps, the last one, trying to convert traffic to dollars. Yes, that last one is an important one (it can literally triple sales... OR... destroy all your hard efforts, if you write poor sales copy). But good sales copy only gets a chance to shine after your PREselling content gets the first three steps right. The Net writing Masters Course is the first and only course that teaches you how to get the whole process right... and it's free. Join the "Top 2%" on the Net. PREsell with information-packed content, then sell with benefit-focused sales copy, smoothly converting your visitors into customers. This 1,2 power strategy is the core to building traffic and earning income on the Net. Right thinking... right process... right results... Profit! You are about to download a .pdf file ("netwritingmasters.pdf"). Save it to your desktop. After you have downloaded, double click it to open. The goal of The Net Writing Masters Course e-book is to help you write better so that you can sell more! It shows you how to use the right words with the right process...how to pull targeted visitors into your site, PREsell them... then, and only then, sell.